Dal can be made plain or brightened up with some added vegetables, like eggplant in this case, and other mixed grains. It can be as thick as you like and eaten as a curry or thin and light to be enjoyed on its own or over rice. 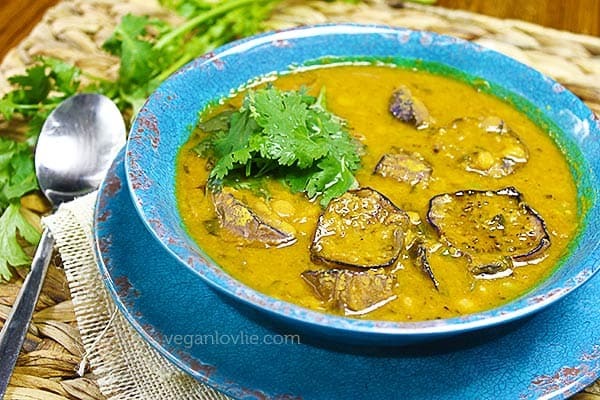 To this day and even prior to my vegan days, my favourite soup has always been dal or yellow split pea soup. I often say that I could live on rice and dal alone if I had to. 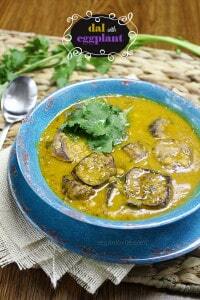 Strangely enough, I wonder why I’ve never until now featured a recipe for dal on this blog. Dal is really something that was cooked regularly at home when I was a child; I remember my dad would always request a “wet” condiment as part of the meal as he never liked his rice dry. This soup is still very much a staple at our place. While it is not necessary to soak the yellow split peas prior to cooking, I do recommend soaking them for about 20 minutes if you have the time as soaking makes them more digestible and they take less time to cook. Chinese eggplant is the most common variety of eggplant that we use in this recipe. The advantage of using the Chinese variety is that when it is sliced, the skin encloses the flesh and prevents it from disintegrating into the soup. But you may use the globe (large) eggplant variety too, in which case you would cut them into chunky cubes of about 4 cm or an inch and a half thick. This soup is usually accompanied with rice or roti and one or two other side dishes or condiments like some sauteed vegetables and a coconut chutney. Soak the yellow split peas for about 20 minutes (optional). Then drain the water, rinse and set aside. Prepare the other ingredient — mince the ginger, chop the tomato, slice the onion + garlic (if using). Set aside. Prepare the eggplant. Cut into slices of about 4 cm (1 1/2 inch) thick. If using the globe eggplant variety, cut into chunky cubes of about 4 cm (1 1/2 inches) thick as well. The Chinese eggplant tend to be slightly more bitter than the larger ones. So, to remove the bitterness, sprinkle a tablespoon of salt onto the eggplant pieces and massage the salt onto them. Then cover them with some water and leave them to soak for about 10 minutes. Meanwhile, start to make the soup. Heat a deep pan on medium temperature. Once heated, add 1/2 tablespoon oil (optional), add the garam masala, turmeric powder, bay leaves, chopped tomato, ginger, onion + garlic (if using). Stir and let cook for about 1 minute. Add in the soaked yellow split peas. Add 3 cups water. Add ¾ teaspoon of salt or as per your taste. Stir, cover and simmer for about 25 minutes or until yellow peas are soft. 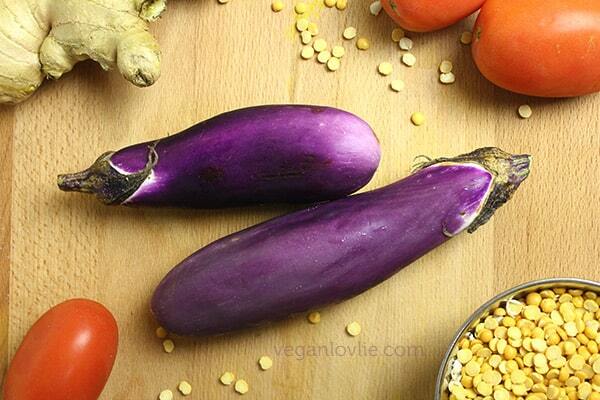 While the dal is cooking, continue to prepare the eggplant. Drain the saline water and rinse them. Then lightly pat dry them on a paper towel. Heat a skillet on medium temperature. Add about 1 – 2 tablespoons of coconut or cooking oil. Once the oil is hot, place in the eggplant pieces. 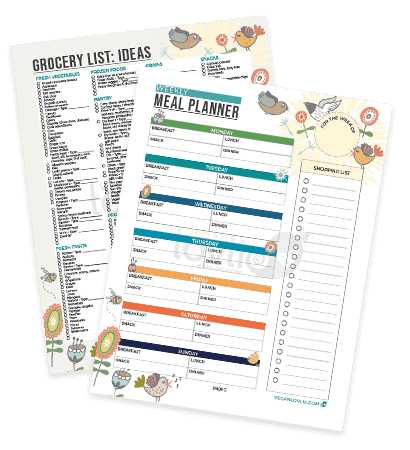 Cover and let cook for 5 – 7 minutes. After 5 – 7 minutes, turn the eggplant pieces onto the other side. Cover and let them cook for another 7 – 10 minutes until they are almost done. There should be a slight resistance when you insert a fork in. Remove them from the pan and set aside. 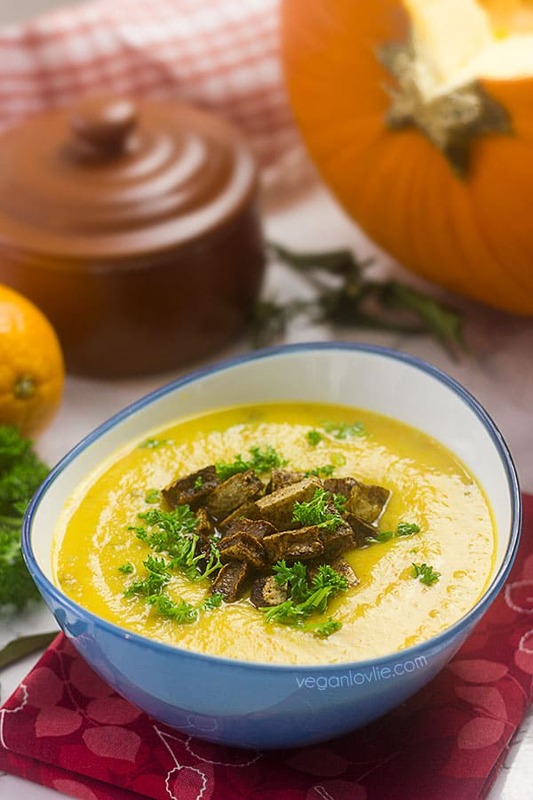 Once the dal is soft, you can mash some of them to make a creamier soup. You may also remove the bay leaves at this point. Then add enough water to make a soup to the consistency that you like. The soup will thicken a little as it cooks further. Now add in the eggplant, cover and simmer for about 10-12 minutes or until the eggplant is soft. To serve, garnish with some coriander leaves. 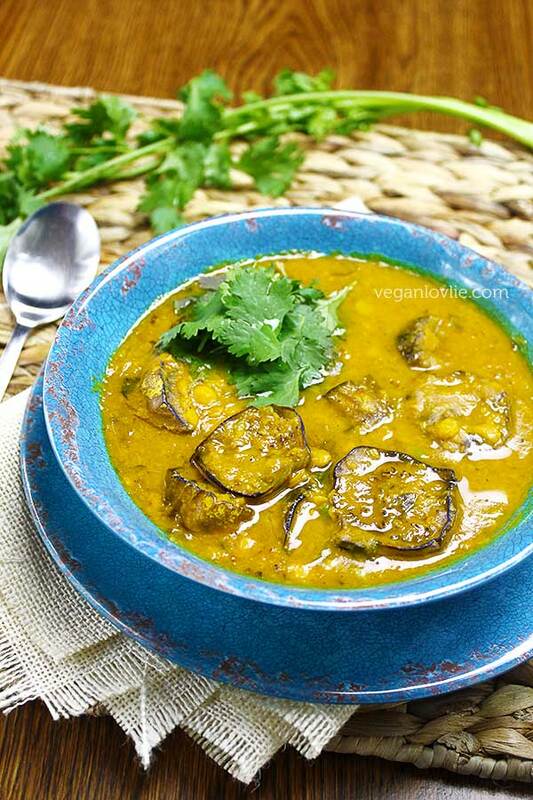 A lightly spiced Mauritian soup, made with yellow split peas and eggplant, which can be enjoyed over rice or with roti as a main dish or side dish. Prepare the other ingredient: mince the ginger, chop the tomato, slice or chop the onion+garlic (if using). Set aside. Prepare the eggplant. Cut into slices of about 4 cm (1 1/2 inch) thick. 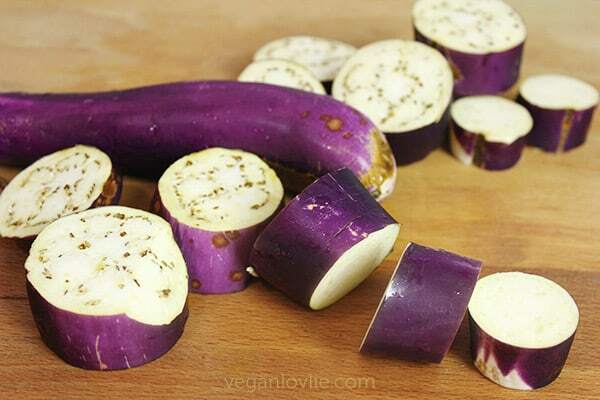 If using the globe eggplant variety, cut into chunky cubes of about 4 cm (1 1/2 inches) thick. The Chinese eggplant tend to be slightly more bitter than the larger ones. So, to remove the bitterness, sprinkle a tablespoon of salt onto the eggplant pieces and lightly massage the salt onto them. Then cover them with some water and leave to soak for about 10 minutes. Meanwhile, start to make the soup. Heat a deep pan on medium temperature. 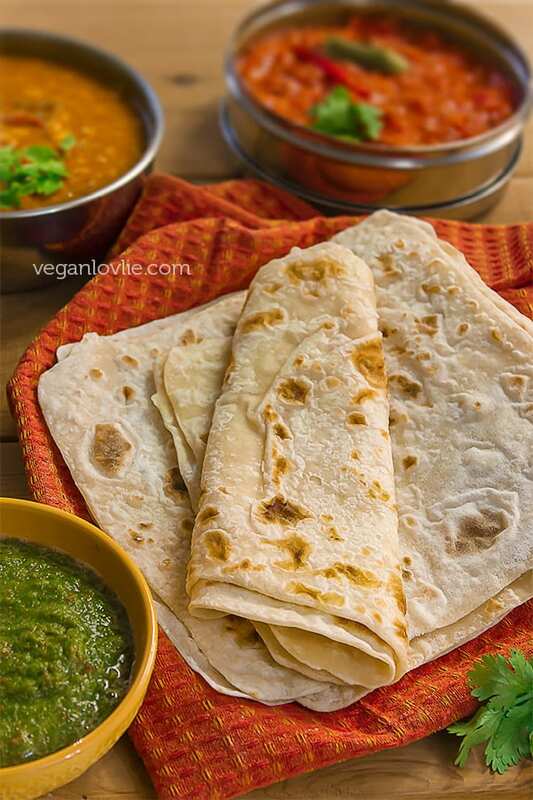 Once heated, add 1/2 tablespoon oil (optional), then add the garam masala, turmeric powder, bay leaves, chopped tomato, ginger, onion + garlic (if using). Stir and let cook for about 1 minute. Add in the soaked yellow split peas. Add 3 cups water and ¾ teaspoon of salt or as per your taste. Stir, cover and simmer for about 25 minutes or until yellow peas are soft. Heat a skillet on medium temperature. Add about 1 - 2 tablespoons of coconut or cooking oil. Once the oil is hot, place in the eggplant pieces. Cover and let cook for 5 - 7 minutes. After 5 - 7 minutes, turn the eggplant pieces onto the other side. Cover and let them cook for another 7 - 10 minutes until they are almost done. There should be a slight resistance when you insert a fork in. Remove them from the pan and set aside. Pin this delicious dal recipe for later. 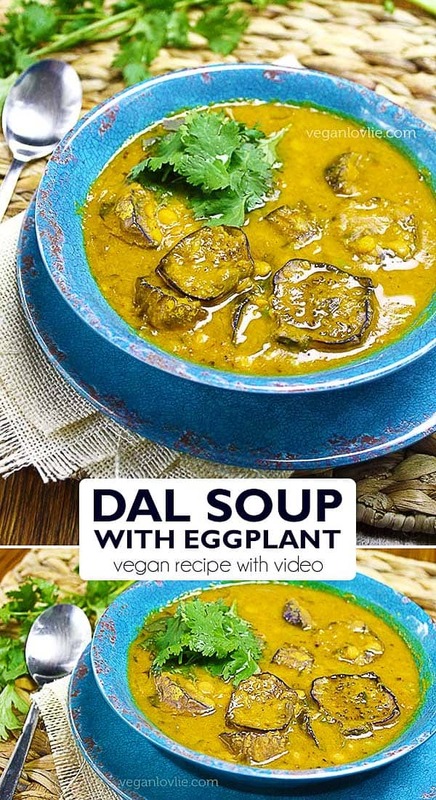 That is a lovely dal recipe. 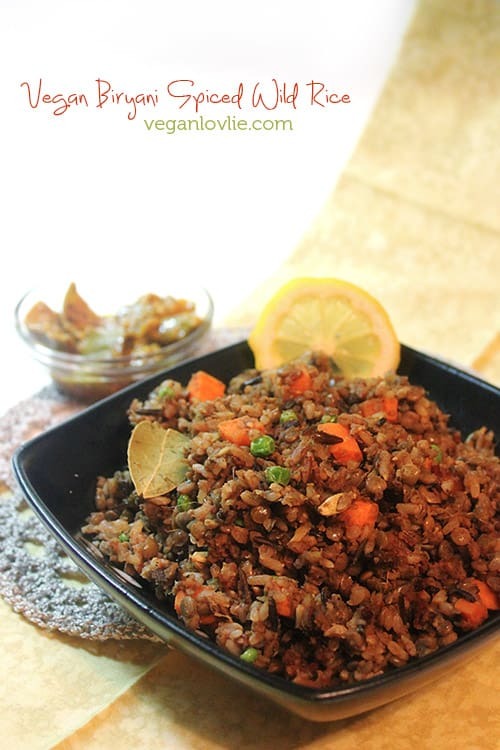 We are the same, my husband often says that he could eat lentils and rice every day. I love the addition of eggplants here. What a wonderful combination ! I 🖤 dal and I 🖤 eggplants. I surely will love this.